I'm always amazed at the memorial power of smells. A few days ago, the house across the street was demolished. Nothing particularly exciting, until I walked out the door the next morning, a particularly humid Kentucky morning, and took a deep breath. And for a few moments, I was right there again. The smell of concrete dust, its acrid, gritty scent, will forever push me back to the aftermath of September 11th. I've long-since given up hope that one day, I will simply smell concrete dust. I don't talk or write much about my experiences on that day and the year following to those who did not share that experience. I was in my last year in seminary. I saw one tower fall. I worked at a hospital that day and Ground Zero for the year after. The basic facts are public. The deeply etched experiences, not so much. At a one-year anniversary service, I spoke about my experiences at the first church I served in Alabama. I regret sharing my memories. Doing so felt deeply uncomfortable, like I was speaking my experience so others could publically examine and partake in my grief as a commodity, in the way we select items from a buffet to which we've brought nothing. Grief is not a commodity. It is our own deeply personal experience and response to having life shifted and gored from what seems comfortable, loving, and expected. I am thankful for those who share how their own experiences that day and in the aftermath have been transformed for them into insight and wisdom. And I am most thankful, quite honestly, for the ones who allow it to stand as it is: a horrific experience. My soul is comforted by the reflections from those who, like me, stood in the smoking ruins and remember thinking this is as close to hell as any of us wanted to be; who share their stories of laughing at something that happened when we were knee deep in wreckage and dust during the days following because we were all afraid to cry because what...if...we...couldn't...stop; who wonder sometimes if it was real, if we were there, then seeing all the media coverage again and feeling the trauma in our cells and souls and knowing we were. Grief is our own, and for all the words and pastoral ideas and theories about it, she must simply be given her due. 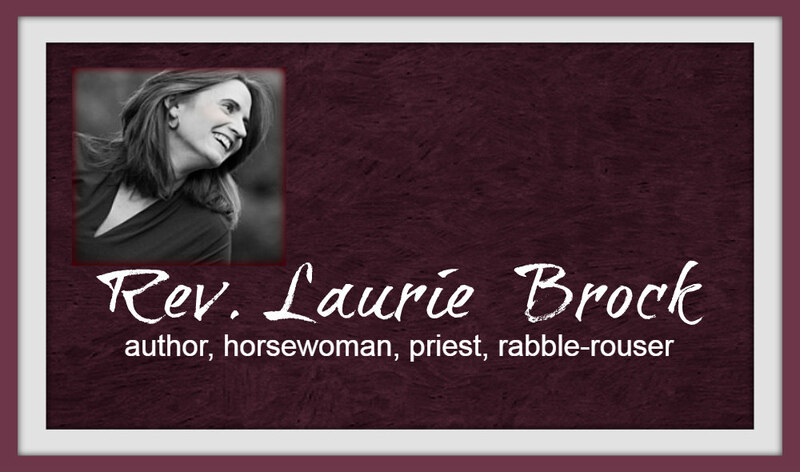 Some give grief her due by sharing their stories, preaching on them, weaving them into theological wisdom. Others of us offer our memories to that particular community, and the community sits silently in the wisdom of trauma, knowing God sits with us in this, too, and God knows the wisdom of silence. Some weeks after 9/11, I took the subway up to the Upper West Side to see my therapist. When I walked down the street to her office, I was unsettled by the normalcy that surrounded me. No posters of missing women and men hanging on every available wall space. No candles and altars making sidewalks sacred. No dust. No smells that weren't typical New York smells. It all seemed just fine. But it wasn't. They, too, were gashed. Their wounds looked different. They were more deeply hidden, but still as wounding. Maybe the wounds we bear on our surface are somehow easier to heal because to go on living, we have to care for them, tend them, and give the jagged edges time to knit together. The wounds below the surface, the ones that aren't as visible but still as damaging, can convince us we are okay. Until we realize we are not okay, and we are pretending others' grief, their anger, and even their healing is our own. Until we realize we, too, must grieve for that which is not as we had planned, for that which may never be okay. Too often, trauma at public event like 9/11 allows an easy way to fetishize grief and anger. We can grieve as a distant public act, never allowing it to connect to and even reveal the brokenness within us - the grief that is truly ours. How might our souls heal if instead we sat with our own unhealed wounds and felt what they say to us. On this anniversary, I again remember the wisdom that grief is my own. I wish I could have learned this from a book, but life does not work that way. I pray for those whose lives have been changed by terror act after terror act after terror act in cities and towns and communities across the globe. I give thanks for my friend Rob who is telling his stories and letting some of us sit silently - in my soul we are all around a campfire on the Plains somewhere, giving the silence of grief her due while coyotes howl. I will remember all the dust and debris that crashed down that day and into the souls of so many. I will cry. And then I will take a deep breath, filled with all the scents of life, and I will breathe again and again. Because grief reminds us of that, too. We are still here, still breathing, still capable of healing and love.